The three new teams that have joined the Formula One fraternity this year were faced with the daunting task of putting together a package capable of making them race at a respectable level in a very short period of time. They've been taking some stick from people like Ferrari president Luca di Montezemolo, who'd rather field a third car for Valentino Rossi than to have six cars racing together in the back of the field.</p> <p>Obviously 2010 has been a tough season for Lotus, Virgin and HRT, but compared to Ferrari they had good reason to leave Silverstone with their heads held high, whereas the Scuderia left Great Britain empty handed and with some serious discussions to be held internally.</p> <p>Reliability has been the new teams number one enemy - with the hydraulic system being responsible for more than 75 per cent of their retirements - but in Silverstone Jarno Trulli, Heikki Kovalainen and Timo Glock were able to do something they'd been yearning since the start of the season: they were able to race each other hard, and being lapped by the field immediately after the Safety Car period, this meant that for 48 of the 52 laps of the race there was never more than 3s between all three of them!</p> <p>In the end Jarno Trulli prevailed but his was anything but an easy weekend. The Italian's car was driven by Malaysian test driver Fairuz Fauzy in the first Free Practice Session, but had technical problems in the next two sessions, meaning Trulli did very little running, on a circuit with a substantial new section, prior to qualifying: "In total I did one flying lap on Friday afternoon and another four on Saturday morning," explained Trulli, "so when I got into qualifying I hadn't been able to build up the level of confidence required, as the car featured some important upgrades and the new part of the circuit, although not too difficult to learn, took some driving to be explored to the limit. "</p> <p>No wonder then that the one-lap specialist didn't feature in the battle for "best of the rest" with team mate Heikki Kovalainen beating Virgin's Timo Glock by 0.37s with Trulli less than one tenth of a second behind the German. Lucas di Grassi, still massively handicapped by the excessive weight of his chassis, was 0.8s away from Kovalainen's time, while Chandhok won the internal battle at HRT, beating new team mate Sakon Yamamoto by nearly 0.4s.</p> <p>The first lap was decisive at the front of the field, with Mark Webber taking the lead and Sebastian Vettel being forced into the pits after being hit - for the second race in a row - by Hamilton's McLaren at the first corner, and it also shaped the face of the race for the New Kids on the Block.</p> <p>Kovalainen kept his position at the start, while Trulli overtook Glock - but while trying to make a move on Alguersuari's Toro Rosso the Finn found himself on the wrong bit of tarmac coming out of Vale and his team mate was able to sneak through. With identical cars and behind a driver that hardly ever makes mistakes, Kovalainen's task was not an easy one, but for a while his mind was busy trying to fend off Liuzzi's attacks, as the Italian recovered from his grid penalty. It took ten laps for the Force India driver to pass both Lotus drivers, who then engaged in a fierce battle while slowly pulling away from Glock.</p> <p>Kovalainen had another hard time in the pits, when he lost 11s to his rivals, leaving Trulli comfortably in the lead of the group with Glock now in second place. But the Safety Car came out shortly after, just as the trio had been lapped - so they lined up all bunched up behind Webber and Hamilton when the race was re-started. Making the most of their experience all three let the field through within three laps without losing position, but now Trulli was able to pull away a bit, while Glock was fending off Kovalainen's attacks. Eventually a mistake by the German, on lap 46, settled the dispute, and even though he closed on Trulli, there was nothing the Finn could do about his team mate and lost the internal battle by just 0.2s after 51 hard fought laps!</p> <p>Having gone through a dark period with plenty of reliability problems, Trulli was obviously delighted with his result: "Finally everything came together, but I spent the first part of the race learning the new section of the track. I could pull away a bit in Sector One, which I knew well, but they were catching me up in the new section, until I felt confident to push hard even there. The last few laps weren't easy, as I was managing some problems in the car, but it was important to finish ahead of the group and give a good result to Lotus on the team's home race. 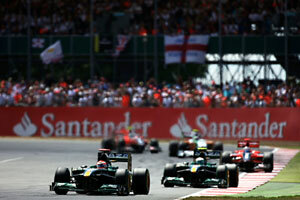 "</p> <p>For Kovalainen, "the first lap and the pit stop hindered my chances of being the fastest in our group. I was battling a Toro Rosso when Jarno managed to get by and then I lost a lot of time in the pit stop. The Safety Car helped me cut the gap to Timo, but I needed more than 15 laps to get past him. I then managed to close on Jarno but ran out of laps to try and pass him. "</p> <div class="wsw-Photo" style="width: 300px" ><a href="http://www.grandprix.com/jpeg/phc/pbri10/sun/glock-kovalainen1-lg.jpg"><img height="200" width="300" src="http://www.grandprix.com/jpeg/phc/pbri10/sun/glock-kovalainen1-rg.jpg" alt="Timo Glock, Heikki Kovalainen, British GP 2010" /></a><p class="photocaption">Timo Glock, Heikki Kovalainen, British GP 2010&nbsp;</p><p class="photocredit">&nbsp;&copy;&nbsp;The&nbsp;Cahier&nbsp;Archive</p></div> <p>Timo Glock was disappointed with letting Kovalainen through with less than five laps to go, but encouraged by the fact he'd been able to race with the Lotus boys, something that hadn't happened for quite a while: "We finally managed to get on top of most our reliability problems and the upgrades we brought to Silverstone worked exactly as planned. We made a clear step forward with the new parts and we've cut the gap to Lotus, so we could race them, which is good news. "</p> <p>Team mate Lucas di Grassi was the only one in the group to retire in Silverstone with - you've guessed it - problems with the hydraulic system. With a chassis that is four kilos heavier than his team mate's and being seven kilos heavier than the German, the young Brazilian is racing with a handicap of 11 kilos and that cost him around 0.4s per lap around Silverstone. The fact that he qualified 0.437s away from Glock shows his pace was as good as his team mate's and in the race he was just 2s behind Glock when he was forced to retire. But, like the German, he left Silverstone encouraged by the progress made by Virgin: "It's s shame I had to retire so early. I had problems at the start and dropped to last place, but I managed to pass both HRT's inside the first lap. I was keeping up with Timo and the two Lotus, bidding my time and saving my tyres, but after nine laps it was all over. The good new was that the upgrade the team brought to Silverstone worked, so now the team is working of making some lighter parts to put on my car and that will certainly help my performance already from the next race. "</p> <div class="wsw-Photo" style="width: 300px" ><a href="http://www.grandprix.com/jpeg/phc/pbri10/fri/yamamoto1-lg.jpg"><img height="450" width="300" src="http://www.grandprix.com/jpeg/phc/pbri10/fri/yamamoto1-rg.jpg" alt="Sakon Yamamoto, British GP 2010" /></a><p class="photocaption">Sakon Yamamoto, British GP 2010&nbsp;</p><p class="photocredit">&nbsp;&copy;&nbsp;The&nbsp;Cahier&nbsp;Archive</p></div> <p>At HRT the "Senna affair" was the focus of the weekend, and without an upgrade to match Lotus and Virgin's evolution, the two F110s were very much on their own during the entire race. Karun Chandhok had, obviously, the upper hand over Yamamoto - the Japanese having his first Grand Prix outing since the 2007 Brazilian Grand Prix! - but was never close to his rivals. The Indian's race became a difficult one, "when I ran over debris from another car just before the Safety Car came out and that damaged my chassis. From then on the car lost a lot of downforce, so all I could do was to try and finish the race without making mistakes, to keep Sakon behind. "</p> <p>Knowing this was going to be a difficult race for him, as he'd been out of action of quite a while, the Japanese driver took a cautious approach to the first lap and then focused on learning the car, on a heavy fuel load, during the first few laps. By lap 14 he was lapped for the first time, when he was just over 8s behind his team mate, but helped by Chandhok's problems he caught up and was just 0.5s behind the Indian at the flag: "It was great to finish the race and rewarding that I didn't make any mistakes during the whole weekend. I now know the car a lot better, so whenever I'll have another opportunity to race, I'll be much better prepared. "</p> <p>That could well be already in Germany or later in the year, as apart from Senna's problem there are some contractual difficulties between HRT and Chandhok, so both Yamamoto and Christian Klien have been told by the team to go to Hockenheim ready to race. With four drivers for just two seats, HRT has some important decisions to make even before the team makes it back to the track.